Caution - A fully-configured, unpackaged server weighs nearly 3700 lbs (1678 kg). Ensure that the route to the installation site is free of obstacles, and always use four or more people to move the server. Plan and prepare the entire route to the installation site. Walk the entire route and note any obstacles that must be avoided. Ensure that all floors along the route can support the full weight of the server. Cover raised data center flooring with fiberboard to protect it, prepare a metal sheet to cross any gaps in the floor (for example, when entering an elevator), and prepare a metal ramp to go up or down minor floor elevations. Ensure that the server doors are closed and secured. Alternatively, remove both doors and take them separately to the installation site. For instructions on removing a door, see Remove the Door. Ensure that all four leveling feet on the bottom of the server are raised and out of the way. See Raise the Leveling Feet for instructions. 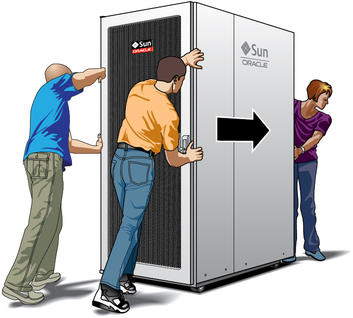 Using four or more people, push the server to the installation site. Always push the server along its edges. Move the server slowly, at approximately two feet per second (0.65 meters per second) or slower. Position people at each corner of the server to help guide it. 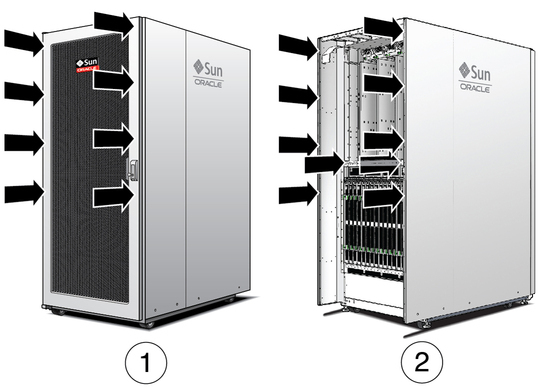 For extra leverage, remove the rear door and push the server on either side of the rear LED panel. For instructions of removing the door, see Remove the Door. Push the front of the server along the edges. Push the rear of the server along the edges and on either side of the rear LED panel. Avoid damaging the server when moving it. Caution - Never tip or rock the server. Tipping or rocking the server, or pushing on the side panels can tip the server over. Caution - Never push the server by pressing in the center of a door. The door might bend under the pressure. If necessary, remove the doors before moving the server. See Remove the Door for instructions. Caution - Be careful when moving the server near floor cutouts. If the server's castors fall into a floor cutout, the floor and the server could be severely damaged. Caution - When maneuvering around corners, always turn the server gradually. Avoid all obstacles on the floor when moving the server.